Bich her ​​family has 6 people, and professional manufacturing glass coat pocket, quite busy. She has 2 sons and 2 grandchildren living together in a house. Since many people living at the same home furnishings should clothes, utensils pretty much, more residential housing combined with a production where daily life is quite inconvenient. Previous work by the busy, almost the whole family determined to produce the business, but now she felt unstable when more and more clothing should not be tidy house when no closet. So you go online looking for the sample closet with your family. She came to Hong Khai Furniture Having explored quite thoroughly in design of materials, as well as the services of Rev. Hong. However, in the stores, she and her husband still pretty thorough check of each hinge, each key, the wood joints. She said, "Designs are here elegant, reasonable price, technical and product lines are beautiful and delicate". So she decided to buy 4-door wardrobe 4 drawer WR-4449W and BD-1613w double bed. She happily said: "Later this year her youngest son got married, she will come back to buy a few more products, lower prices for her memory and somebody else!" Well thank her sincerely, in Revelation Red always respect and care for each customer, especially intimate. 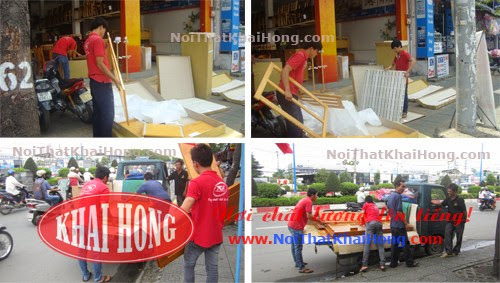 She assured and if necessary to the interior let Khai Hong served her, make sure she will not disappoint. Thank you and family who have supported the Red Revelation. Wishing you and your family good health and good business.